Your brand is relatively new to Facebook, you only have a $400 Facebook marketing budget and aren't very confident about making it work. How can your business make every dollar count in attracting and nurturing quality audiences? Compared to an interest-based Saved Audience, which typically requires many more rounds of refinement at the start, buying targeted ads to a Custom Audience could save you lots of time and money in attracting more highly relevant audiences. In my experience, they have consistently proven to be higher quality audiences, with a lower cost per click, higher engagement and click-through rates. Start identifying, creating, nurturing and growing them through your ads as early on as you can. If you have less than a total of 500 people in each custom audience set, create a Saved Audience consisting of several custom audiences and their Lookalikes. Over time, once your brand’s presence on Facebook grows, you can begin segmenting them based on more specific actions you wish them to take, on Facebook or other marketing touchpoints. Is your page getting a lot of unintended attention from dubious profiles in other geographical regions beyond your targeted range? This issue is especially common among new pages, or brands that are new to social media advertising. One way to minimise this is to specify your page’s preferred audience profile. It is intuitive to specify inclusion interests, but what even Facebook marketers might not know is that it is also possible to exclude people. Facebook’s exclusion tool allows you to indicate the ideal location, interests and age range of people you do not wish to target, allowing you to then focus your page reach on people who matter. While Page Like Ads are undoubtedly the most effective tool for fan acquisition, it is not unusual for certain target groups to be costlier to attract. This is common if you are (i) a new brand with little existing brand equity, and (ii) advertising in a country where majority of its citizens are educated and digitally savvy, have shorter attention spans and less patience, are over-exposed to brand messages and increasingly hard to impress. Even if your Cost Per Like (CPL) becomes too costly in relation to your industry benchmark, not all hope is lost! Repurpose your Page Like Ad budget from this audience group to other more cost-effective audiences, or ad types such as Post Engagement Ads; Post Engagement Ads have the potential to meet their objectives of increasing engagement rate and more. Here’s an example: someone sees your ad on Facebook, is interested enough to click into your page profile, and subsequently clicks ‘Like’ on your page upon finding your content useful. Learn the behaviour and preferences of this group of people, and consistently nurture them with relevant and useful content through post engagement ads. At the end of every month, review the performance of your content and add more budget to content posts that received high engagement, or those that led to the most number of page likes. Remember that these tips should be used in sync with a sound social media strategy. While they may be able to help to extend the reach of your Facebook content in a more cost-efficient manner, it is still critical to first build a strong base – having a strong brand identity, crafting good content, and presenting it in a genuine manner – though I would have to save that topic for another time! These Facebook advertising tips are not exhaustive, and we would love to hear about other ways that have worked for you. Drop me a message on LinkedIn! Visuals designed by Yuni Ardilla, our junior designer. Deborah project manages at AKÏN, where she primarily takes care of clients' social media platforms. She particularly enjoys crafting sustainable, measured social strategies that build brand value. She values authenticity in all things, and aims for this to translate in the work that she produces. 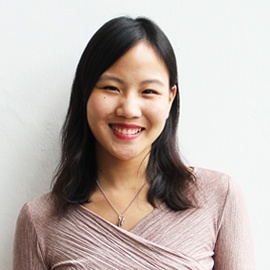 Deborah is a Marketing major with a Business Management degree from Singapore Management University. When she’s not being a busy bee at the office, she finds joy in flower art, learning more about essential oils and immersing herself in nature.